This pdf is 103 pages long, 1 page front cover, 1 page blank inside of front cover, 1 page editorial, 1 page ToC, 1 page back cover, 1 page ad, 1 page SRD, leaving 96 pages. We also get three pages of monsters indexed by CR, alphabetical order and a wandering monsters-table. After one page of foreword by Tim Hitchcock, we are introduced to the creatures and lairs. 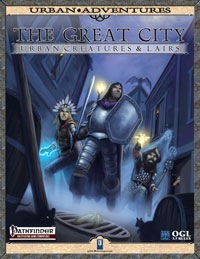 The best of monsters provide the GM with a plethora of ideas for adventures or encounters once being read and this book goes a step further – it also provides “lairs”. Which is actually a misnomer – this monster-book goes far beyond just providing lairs for the monsters and instead often provide mini-adventures or at least encounters. I won’t spoil the encounters/adventures, but I will comment on the best ones. That being said, let’s dive in! -Arrbiong (CR 2): Urban fey that feeds off dreams with a nice twist and some great roleplaying potential. -Bay Zombie (CR 4) & Bay Zombie Leviathan (CR 18): Necromantic experiments gone wrong these creatures feature tentacles and claws. The leviathan makes for a great mystery/campaign arc/seed that is further enhanced by the lair. -Bone Hag (CR 8): Urban hag with a flexible anatomy and a great, disturbing artwork the made me reminiscent of my old Solomon Kane stories and comics. The legend provided along the lairs also rock and this one just screams to be used. -Corpse Rider (CR 4): A disturbing, tiny fey (think tooth-fairy gone horribly wrong) that can take over dead people and animate them. Their hooks rock and make for great conspiracy-potential. -Earwig, monstrous (CR 1) & Earwig Swarm (CR 4): The lair for these monsters is actually a supremely cool sketch of a low-level adventure. Two thumbs up! -Fabricata (CR 1/2): A creature worthy of China Mièville in its imaginative potential, these self-aware constructs are animated pieces of cloth that have their own society and secret wars. Awesome! -Ferals include Feral Dogs (CR 1/2), Feral Cats (CR 1/4) and a Feral Cat Swarm (CR 2). Cool, but no lair/sample adventure is given. -Devil, Gutterkin (CR 5): Manipulative little devils that push addicts and people who are down on their luck over the edge. Despicable and cool. -Harvestman (CR 6) and his Harvesters (CR 2): Arachnid construct that, as a local boogeyman, hunts and drains arcane casters. The lair/mini-adventure is cool. -Jacke-in-the-Rafters (CR 7) and the Weitheryn template (CR +1): An old Goblin who cheats death by killing other people in its stead. Not only does the template and creature rock, but the adventure is great, too. Especially the ideas for further adventuring. -Mokkahl (CR 11): A bulette-turned-ooze by necromantic/arcane waste, this thing is not only disturbing, but might make for a terrible encounter with the PCs. Nice! -Penumbra Bride (CR 9): Shape-changing aberrations, these brides make for a disturbing twist on the doppelgänger-trope. Their lair is a great location, too. -Saaran (CR 10): Once a pure and noble gladiator, this giant now is a broken thing that still clings to his former principles and would make for a great “right wrongs-adventure”. -Screegie (CR 1/4) and Screegie Swarm (CR 2): Eye-picking, impersonating birds, their mini-adventure once again rocks. -Shi (Sin-Eater) (CR 13): An extradimensional earth-aligned junkie dependant on souls, these creatures may unintentionally raise the dead and, by consuming souls, get into conflict with undead or work as a medium for the deceased. -Siluri (CR 3): Croaking monstrous humanoids, they are unique and disturbing. -Stone Gouger (CR 1/2): Miniature gargoyles, they live in the walls and attics. Unfortunately we don’t get a lair/mini-adventure for this one. -Tillochann (CR 14): Extremely cool owl-like outsider with bizarre abilities to use silk and cocoons. The lair is ok, although it is not up to the supremely cool critter. Believe me, you haven’t seen one like these before. -Zaelemental (CR 13) and Zaelemental, Greater (CR 16): Filth and muck-aligned creatures of all the negative, tainted dark things associated with cities, these creatures make frightening and yet cool enemies. The lair rocks, too. Editing and layout are great, the b/w-artworks rock, the file is extensively book-marked and the lairs/adventures rock. The creatures are all killer, no filler and quite frankly, each and every one of them made me immediately come up with either an additional encounter or even a whole adventure or campaign-arc revolving around them. The sheer quality and the imaginative potential of the writing is supreme and the content is just stunningly well-crafted. While I encountered 2 minor editing glitches, for the low price and the exceptionally awesome content, I’ll settle for 5 stars plus seal of approval.